On Monday, Verizon launched what it called the world’s first 5G network. As 5G is deployed, the FCC is limiting what local governments can charge telecom companies for using city utility poles for thousands of small cell towers. Officials in Boston and other municipalities said new federal rules on the deployment of advanced 5G wireless systems could cost them billions of dollars in lost revenue, by limiting what local governments can charge telecom companies for using city utility poles for thousands of small cell towers. The Federal Communications Commission last month capped the amount cities can charge telecom companies for the use of these poles, at $500 for installing on an existing pole and at $270 for an ongoing annual fee. This is far less, sometimes thousands of dollars less, than what Boston and other communities charge. “While the City of Boston supports the expansion of telecommunication services to improve services available to all residents, that benefit from private companies should not come at a cost to the taxpayers of Boston and should not strip local municipalities of their ability to oversee public rights of way,” Boston Mayor Martin J. Walsh said in a statement. Hundreds of these small cell towers have already been deployed in Boston, to provide improved 4G cellular service. But many more will be needed as 5G is deployed. The city did not provide the current charges. But Boston’s 2016 contract with Verizon quotes an annual fee of $2,500 to attach the cells to city poles; another telecom provider pays Boston $500 per pole, plus 5 percent of its gross revenues. Former Boston chief information officer Jascha Franklin-Hodge said the money from pole fees is used to repair streets and called the FCC ruling an unreasonable infringement on the responsibilities of local government. “This approach runs roughshod over cities and towns,” Franklin-Hodge said. 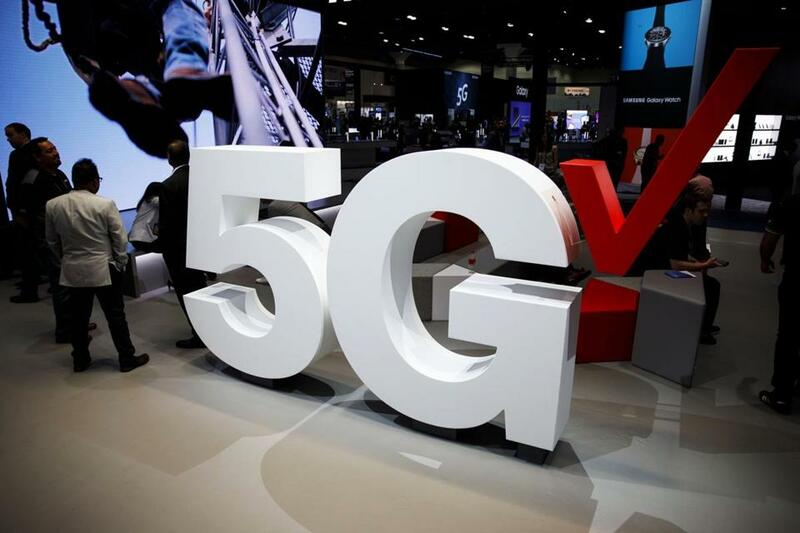 Wireless companies such as AT&T, Verizon, Sprint, and T-Mobile are beginning to deploy 5G wireless technology, which promises much faster Internet speeds than current connections. On Monday, Verizon launched what it called the world’s first 5G network, offering service in parts of Houston, Indianapolis, Los Angeles, and Sacramento. But 5G networks rely on ultra-high radio frequencies that do not travel as far as 4G signals, or penetrate walls as well. That means wireless companies have to set up 5G cells every few hundred feet, often mounted atop city-owned lampposts and utility poles. In addition to onetime installation fees, some cities also charge an annual fee for continued access to the poles. For instance, annual fees of $4,500 per pole are the norm in New York City, according to FCC Commissioner Brendan Carr. The new rule requires that fees must be limited to the amount needed to cover the city’s costs. Some 20 states have similar rules capping pole fees, and the FCC used these rate caps as a guideline in setting its own. For instance, the new rules set a limit of $500 in upfront fees for use of an existing pole or $1,000 for installation of a new pole. There’s a new limit on recurring annual fees, which will be capped at $270, unless a city can show exceptional costs that justify a higher rate. Carr estimates that the reduction in fees will save the telecom companies about $2 billion per year, allowing companies to accelerate deployment of 5G across the country, including to underserved cities and towns. “We think at $270 the economics are going to work out so you’ll see a lot more 5G deployment,” said Carr, who noted that dozens of smaller communities have expressed support for the FCC rule. The new FCC order also requires that municipalities issue permits for cell installations within 90 days after being filed. In Massachusetts, the typical time frame for issuing permits is 120 days, according to Geoff Beckwith, executive director of the Massachusetts Municipal Organization. He argued the new rule is a windfall to telecom companies because “it would essentially have the public subsidize” the buildout of their networks and predicated local governments will sue to block it.